The countdown is on...only 3 more days! To you have your pressies wrapped, sent out or under the tree? I wanted to create a look that included the whole family. Of course Mom looks the hottest , because well, that's just how it goes, and I would love to own those killer shoes! Santa?! Are you there? Do you read my blog?? Please get me those shoe-ies. Now go link up with AV to see what other fabulous Christmas apparel there is. Just finished making my last Christmas gift last night and only have a few left to wrap! Love all the outfits! I love that you had a Friday Fancy that involved littles! adorable! I love that red dress!! I hope you had a very Merry Christmas Cheryl! 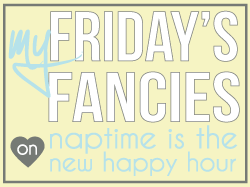 Thanks for linking up at this weeks Friday Chaos! I'm now a new follower.